Enterprise Modernization – The Next Big Thing! “We tend to think the strong will survive, but a virus is a very small thing that kills big things.” Horace Dediu, Clayton Christensen Institute, speaking about the fall of Nokia. All enterprises, be they large or small, national or multinational, commercial or government agency, American or Chinese, Japanese or European, are carrying the dead weight of their history and almost certainly continuing to add unnecessary complexity and excessive cost that will progressively reduce effectiveness, with the potential to trigger existential crises. Newer enterprises including Internet platform and Cloud based companies are not immune from this effect. As Horace Dediu has commented, Nokia is a classic case of a large enterprise brought from market leadership to irrelevance and zero value in an extremely short space of time. In the past, modernization has become synonymous with technically related “application modernization” The term “modernization” is commonly used to refer to information systems, applications and technologies. And it is very common for systems or applications to be “modernized” because a technology has come to the end of its life, or an application is so antiquated that it cannot support newer business process patterns such as multi-channel and mobile. More generally organizations clearly implement modernizing programs without necessarily using the modernizing name. For example transformation programs or projects will often involve considerable elements of modernization. Similarly adoption of Agile methods may be considered a form of process modernization. Or the introduction of DevOps practices, enterprise architecture, master data management, life cycle management etc. But it is notable that each of these forms of modernization are discipline centric. It is very rare for an enterprise to undertake concerted effort to understand what modernization really means for a specific enterprise and to plan and execute modernization that delivers inter-discipline collaboration in support of specific modernization objectives and goals. Each enterprise has unique modernization needs. A bank may see a primary modernization goal to establish core banking systems that reduce the risk of negative customer impact, such as delays or errors in transaction processing. Also to be able to introduce price and product change in days or weeks. A healthcare company may similarly see the requirement to change prices rapidly but equally the need to rapidly implement new legislation. A retail enterprise may see the ability to interact with customers using processes that span multiple technology, shopping and delivery channels, and to be able to influence the customer decision making process to achieve maximum customer satisfaction. A key element apparent in all these modernizing goals is that modernization is not about achieving a new plateau of capability and functionality. Rather it is about enabling continuous, short cycle time response to change, targeted at the very specific areas that are mission critical for the individual enterprise. The problem with modernization is that it is widely perceived as slow, very expensive and high risk because the core business legacy systems are hugely complex as a result of decades of tactical change projects that inevitably compromise any original architecture. But modernization activity must not be limited to the old, core systems; I observe all enterprises old and new, traditional and internet based delivering what I call “instant legacy” [Note 1] generally as outcomes of Agile projects that prioritize speed of delivery over compliance with a well-defined reference architecture that enables ongoing agility and continuous modernization. 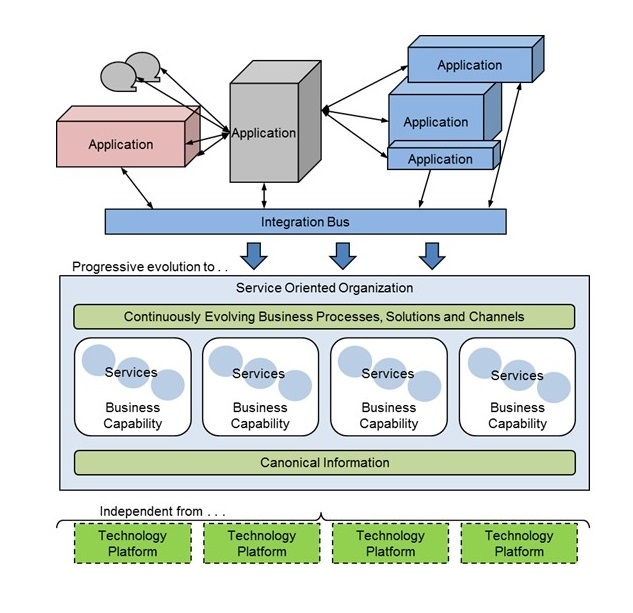 What’s required is a modernization approach and strategy that progressively breaks out business and technology components that establish highly independent units of business capability that comply with a reference model and architecture that ensures architecture agility and implements clear fire breaks between the components. But as discussed, enterprises are extremely reluctant to undertake modernization as they see it as all cost and risk. Transformation projects are widely viewed in the same way. And anyway immediate business priorities always trump housekeeping! I refer to these as “vectors”. Mission critical goals that will require actions and change right across the organization. Single projects are generally not going to cut it. Therefore the vectors provide a mechanism to exert influence (demand shaping) over the incoming application demand management pipeline and to select and coordinate multiple project actions. 2. Mandate Reference Architecture for Agility. Establish a reference architecture for business agility that defines the minimum necessary architecture compliance to ensure continuous business evolution. Mandate that all core business capabilities are implemented as software services and components. 3. Integrate Agile Architecture AND methods. Implement Agile practices that give equal weight to agile architecture and agile project delivery. Demonstrate small, incremental delivery steps, business capability by capability, service by service. 4. Govern business agility. Automate governance by establishing model driven architecture and development tooling that ensures compliance with the reference architecture. 5. Integrate Business and IT. Practice conceptual business modelling to establish common business and IT vocabulary independent of existing applications, align business and software services and reengineer the organization around business capabilities and services. 6. Get top level sponsorship for the Enterprise Modernization Roadmap. Recognize enterprise modernization as a major business priority and elevate to the highest levels of the enterprise to make it happen. The enormous, disruptive creativity of Silicon Valley is transforming how companies make decisions, store data, reach potential customers, outsource activities, processes and capabilities, and how people communicate, make friends, protest and shop. No enterprise is immune from this effect. Accordingly, modernization today means reinventing the way enterprises work, the business model and systems, and being genuinely agile. You only do this by ripping up today’s world and turning it into a genuinely flexible structure of independent components that can flex and morph continuously. 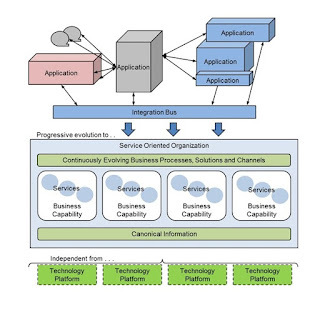 Application Modernization should be long dead and buried. Enterprise Modernization is an existential priority for all enterprises, not just those with mainframes and COBOL! I guess most readers of this blog know that Ireland went through a massive bust in 2008/9. The primary cause was a massive building bubble. And because the economy was dependent upon building related taxes, the crash was brutal. One of the side effects of the bubble was that building standards suffered. In one extreme case a block of apartments was constructed with no fire safety protection! There were many, many more prosaic examples. In my own case I had building works completed that had to be completely reworked within a couple of years! The reasons for the low quality were complete lack of governance. In the boom times many people set-up without adequate skills and many developers over-committed to deliver more work than they could manage competently. In Ireland, unlike say the UK, there was no independent building inspection regime. Architects merely had to give approval for work to proceed at the major stages. There was no independent oversight. Today in the Agile project world the idea of self-governance is pervasive. But the parallels with the Irish governance regime in the noughties is too close for comfort. The Agile principles guide that projects should be built around motivated individuals, given the environment and support needed and trust them to get the job done. Further valuing working software over comprehensive documentation is effectively encouraging teams to dispense with transparency and traceability. While this may work in small scale environments, in a large enterprise the idea that all teams will be highly skilled, properly resourced and motivated contradicts general experience. So in many large organizations conventional governance is still a requirement that can be highly detrimental to the efficient Agile process. c) Automation systems that progressively incorporate the principles and reference architecture into frameworks, tooling, design time platforms, deliverable profiles and knowledge management systems. e) A communication system that ensures Agile projects are fully implementing the governance system, and providing at least retrospective feedback to the CoI that contributes to a common asset base as well as practice maturity. And in this post I want to explore further the organizational issues. In the image I show there are three primary stakeholders in the Agile process. A Design Authority (DA), the Community of Interest (CoI) and everyone else; let’s call them the Crowd. And what’s really important is this is not a conventional hierarchy. The Crowd, developers, architects, product owners and business analysts are the drivers of the process, engaged on business improvement delivery projects. The CoI are also part of the Crowd insofar as they are also engaged on delivery projects, but they are individuals that have a further role of taking responsibility for coordinating consistency of the approach taken by delivery teams. As shown the CoI will be responsible for reference and enterprise/domain architecture and have an approving role for solution architecture and design, platform components and factory configuration. And the key point here is that all of these key deliverables start by being crowdsourced. The delivery teams are in the best position to establish solution architecture and design. The delivery team member with a CoI role is responsible for identifying and promoting candidate components of reference architecture, the design platform etc to the collective CoI. The DA is different. It’s still not hierarchic, but it does approve demand shaping decisions, reference and domain architecture. This generally happens in response to delivery project concerns, for example when there are affordability or timescale issues with “doing the right thing”. You know the deal, if we don’t worry about technical debt, we can deliver on time and budget. But if we address the bigger architectural questions, and deliver solutions that will reduce complexity, reduce operating and maintenance costs etc, then the delivery date will be pushed out and additional resources required. Frankly this is the right time to address the value of architecture, because the questions are real. So what I have described here, and in the last post, is an evolving governance model in which the definition of “self” is stretched a little to encompass the role. The Crowd has a major role in informing the requirements for policy and architecture as required for specific projects. The CoI are responsible for synthesizing these requirements to meet some broader, longer running remit and the DA guides on bigger questions of architectural compliance from a strictly business value perspective. The Crowd and CoI are also responsible for automating policy wherever possible; selecting exemplar solution components for platform and factory implementation, so that the very best solution components become reusable as patterns, configuration items, coding standards, services etc. Whether it’s in a building or software development context, simplistic self-governance doesn’t work in complex enterprise situations. However understand the roles and responsibilities, work bottom up with Crowd sourcing and you may just motivate a very large team by enabling them all to contribute to the greater good. “Last year the decision was finally made to mandate Agile across our enterprise. The decision was taken, even though there were many unanswered questions. The assumption was that forcing the migration, along with adoption of popular “enterprise Agile methods” would ensure resolution of the outstanding questions. In practice, Agile methods have been very effective in delivering specific digital business initiatives. But almost inevitably the distribution and delegation of architecture has resulted in duplication, inconsistency and increased complexity, across all project types including legacy and new projects. We are now concerned that we no longer have an effective governance capability. The question is how do we fix this without losing the undoubted benefits of Agile methods?“ Enterprise Architect, F2000 company. Over the past few months I have heard this message over and over again. While Agile is being successful, it is increasingly in conflict with broader goals. And this is clearly becoming a major issue, manifest in increased complexity, horizon of change and coordination issues as well as inconsistent customer experience. I am now regularly advising a practical approach to resolution by addressing from the governance perspective. In many organizations governance is still practiced by phase or stage gate peer review, and Agile projects are forced to accommodate, which leads to WaterScrumFall or worse. But governance criteria and policies are often very weak anyway, out of date or non-existent. Consequently governance is frequently a matter of opinion and experience, highly dependent upon the experience of individual reviewers. As we all know, a basic principle of Agile methods is delegation of responsibility, and ideally we need to delegate governance to the Agile practitioners and teams. So the question is how to implement self-governance and ensure quality and consistency of governance? I think it was an old John Cleese training film in which Cleese himself plays the part of a manager telling a subordinate that he is now empowered, and he scatters magic dust over him and shouts some magic words saying, “You are now empowered!” Clearly this isn’t any more useful than telling an Agile team that they are now self-governing! Rather we need to go back to basics and define and communicate what governance is required and provide Agile teams with guidance on what is expected. That sounds good in theory, except that in practice no one is going to be able to accurately define all the governance requirements; certainly not in a fast changing, Agile business and technology environment; nor will Agile development teams be able to keep up with a bureaucratic regime that continually issues edicts that everyone is expected to adopt. 1. the centricity of the architecture runway, and the tight relationships between policy, reference architecture, reusable assets and the automation platform. 2. variants guided by various dimensions of scope, which may include applicability, business or technology domain, or even the maturity of the business or technology domain to achieve compliance. Reference Architecture is a critical capability, defining the architecture styles and patterns and applicability. But reference architecture shouldn’t stop at models, it must be realized in code in the Design Platform – which progressively realizes the reference architecture as application level infrastructure reusable across multiple projects. The design platform is typically managed by the CoI, a collaboration of senior developers and architects that decide what should be in the platform and develop the models and code as exemplars that succeeding projects will be happy to use, customize and or extend. The design platform is therefore a critical governance tool that actively evolves, managed by the CoI and constantly challenged by project developers to provide optimal solutions to delivering on the principles and reference architecture. As a by-product the mature design platform will also be a major productivity tool; for example in the Everware-CBDI Agile Service Factory, over 80% of the code for typical large projects will be automatically inherited from the platform. As shown Principles are generic patterns or techniques that guide strong solutions to business problems. The application of Principles is achieved by Policies. But not your father’s policies! In many (most?) organizations Policies are outdated lists of standards. In Agile governance, policies should be a context based record of how the principles and reference architecture have been realized. Like principles, policies are not mandates from senior management, they are transparent communications of pragmatic decisions made by the CoI on the best way of delivering an optimal result in a particular context, reusing tried and tested methods supported by existing architecture and design assets. This is therefore a continuously evolving body of knowledge, specifically tailored for one enterprise’s needs. Examples below. Note in particular the Policy Context that highlights applicability and exemption. Many Agile teams are now using the Scrum of Scrums approach to coordination of multiple projects. This is a highly effective mechanism to manage the pan-Scrum backlog. However this coordination must not be confused with architecture realization. The Community of Interest is not a Scrum of Scrums, it is a group of the most respected architects and developers who will be active practitioners in architecture and development projects, who coordinate the realization of the architecture, the models and implementing code, typically in direct response to project demand, but involving CoI members as appropriate to review, refine and contribute to improve the solution, to be optimal, generic, principle and policy compliant. The Architecture Scrum may therefore on occasions be a series of architecture specific sprints, perhaps at commencement of new programs, or in response to significant new areas of reference architecture or design platform requirement. But in momentum situations the Architecture Scrum is more likely to be integral to multiple development Scrums. In a generic sense, governance is concerned with ensuring the integrity of the delivered product. This requires a strong focus on the architecture and how it is realized. As many organizations are now realizing, delegation of architecture in an uncontrolled manner is high risk. The approach outlined actually encourages delegation of architecture but to a coordinating body, the CoI, which itself is charged with supporting project demands and broader organizational objectives. But the approach outlined also recognizes that there needs to be explicit documentation of architecture principles and policies and their application in order to allow communication and review, and justification of business value. This is a necessary level of documentation needed to communicate to the many stakeholders involved. Reliance on opinions expressed on a case by case basis, or architect resource involvement in projects without the backing of strong, defined reference architecture, gives programs or projects far too much discretion. Whilst we may laugh at John Cleese’s magic dust, in practice the embedding of key architectural code into the platform layer actually does make governance considerably more effective. But even if it’s incredibly effective, it’s not magic. An effective CoI comprising the very best architect and developer skills available means all projects have access to optimal solutions as well as automatic compliance. Agile governance as described in this post is therefore not an extension of Agile methods per se, rather it is a bridge between Agile methods and agile architecture that defines and ensures desired outcomes, without compromising the integrity of the Agile process.